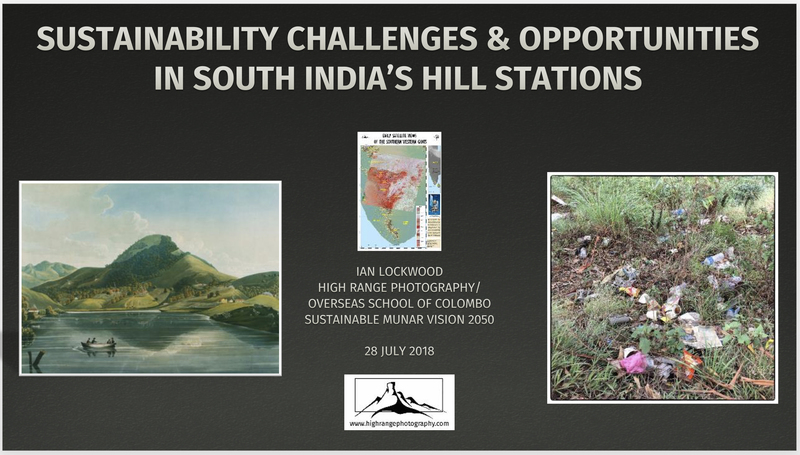 Opening slide from the author’s presentation exploring sustainability opportunities and challenges in the hill stations of southern India. The Sustainable Munnar-Vison 2050 conference held this last July reviewed a variety of issues and made recommendations about a way forward for what is becoming a threatened hill station in an exquisitely beautiful part of southern India. The conference was organized by the High Range Wildlife Preservation Association with support of the Kanan Devan Hills (Ripple Tea) company. The conference date at the end of July meant that rainfall and flooding events soon took over the headlines in Kerala and unfortunately little has been published about the important conversations and presentations. I was privileged to participate in the conference on the invitation of the association’s members Jojo Guha Thakurta and Mohan Varghese. In this post I review some of the key points of discussion and a few images from my days in the High Range. Twelve years ago, the High Range Wildlife & Environment Preservation Association hosted the 4th World Conference on Mountain Ungulates. At the time, Mohan Alembath, the former Kerala wildlife officer who set up the Tahr Foundation had brought together key people to discuss themes of ecology and mountain landscapes with a special focus on the Nilgiri tahr. The meeting was timed for the 2006 Kurinji flowering. Luminaries such as George Schaller and Cliff Rice were in attendance. I had communicated with both of them when I was putting together my articles on Nilgiri tahr in the 1990s (published in Environ and Sanctuary Asia). Thus, I was disappointed to miss the conference for unavoidable reasons (our daughter Amy was about to be born in Colombo). The 2018 Sustainable Munnar conference offered me a chance to make up and spend time with my friends in the Munnar /Kerala wildlife circles. The impetus for the conference this year was the issue of tourism in the High Range and the changes that its rapid growth has thrust on the landscape. As with other places in India, the explosion of tourism has been both brought mixed blessings. There has been a veritable explosion of hotels and other facilities trying to cater to a cliental of domestic (and some foreign) tourists looking for a hill station experiences in the High Range. Ironically, Munnar, a sleepy plantation crossroads town started in the late 19th Century, was never a “hill station” in the way that we understand it. In fact Munnar, spent its first 150 years blissfully isolated and unknown. Visitors wanting a hill station experience in southern India, traditionally headed to Ooty, other Nilgiri Hills destinations, Kodaikanal and Yercaud. However with the advent of globalization in the last 20 years. -namely improved transport networks, higher incomes for an emerging middle class and widespread private vehicle ownership, Munnar’s fate has been dramatically reshaped. Jose Dominic, James Zacharias and Vivek Menon at the High Range Club preparing to leave for the conference. The author speaking about hill station sustainability in south India’s mountains. Sustainability in the hills of Kerala has been a topic of interest in the past. Scientists, individuals and the Kerala Wildlife Department have a solid track record of promoting conservation initiatives and trying to limit the negative impacts of tourism growth and ill planned development schemes. The UNDP-sponsored High Range Landscape Project, in fact ,sought to set up a management plan for the entire landscape. Unfortunately, that enterprise never came to fruition because of resistance from local politicians concerned about losing control of land rights (see articles and reports below). Sign board at Eravikulam National Park’s Rajamalai tourism zone. This is arguably one of India’s best protected areas from the point of view of management dealing with high numbers of visitors and using innovative solutions to mitigate negative tourist impacts while offering them an opportunity to witness an incredible landscape and key endemic Western Ghats species. It was a wet, windy monsoon morning in Munnar when participants and speakers gathered at the KTDC Tea County hotel above the town center. Several of us had taken a short visit up to Rajamalai before the conference (see photos). Members of the High Range Wildlife & Environment Preservation Association greeted participants and dignitaries. The chief guest was Tom Jose, the Chief Secretary to the Government of Kerala. KP Matthew the PCCF from the Kerala Forest Department and K. Matthew Abraham the managing director of KDHP were on stage to give felicitations. Vivek Menon, the founding director of Wildlife Trust of India, was the first speaker. He discussed a variety of themes in “Complete Conservation: Ecologically Sensitive Development, a Global Perspective.” Vivek is based in New Delhi and has Kerala roots, which gave him an important perspective when speaking to the audience. I know of him from his classic field guide to Mammals of India but this was my first time getting to spend time with Vivek. A key point from his presentation was the idea of learning conservation lessons from other places around the world and he he shared insights and case studies from around the world that would be of interest to manager and planners in the Indian conservation context. My talk was entitled Sustainability Challenges and Opportunities in South India’s Hills Stations. Using concepts from the IB classes that I teach, I started with an exploration of sustainability and carrying capacity before detailing a brief history of the hill station in Kerala and Tamil Nadu. The main thrust was to use the case study of Kodaikanal as an example of what not to do. Our home in the Palani Hills faces clear and imminent challenges from uncontrolled growth/sprawl, unchecked visitor numbers and a lack of planning (implementation of master plans) with no clear players empowered to lead efforts to move Kodai on a sustainable path forward. Managing solid waste and water resources is a major challenge with little meaningful action taken thus far. I highlighted the fact that the High Range has the advantage of clear stakeholders in the plantation sector (where most private land is owned) and a forest department with its strong track record of conservation initiatives (in Eravikulam, Chinnar, Meesapulimalai and Pampadum). After a lunch break Dr. P.S Easa, the distinguished former director of the Kerala Forest Research Institute gave a talk entitled “Human Wildlife Conflicts-Reflections and Mitigation Strategies.” Jose Dominic spoke about his experience with the Spice Village group in a talk entitled” Responsible Tourism-Vision & Strategies.” His narration of the experience of setting up the first ecotourism ventures in the Lakshadweep islands and the Coconut Lagoon, Cochin was insightful. I have long admired the initiatives taken by the company at Spice Village in Kumily/Periyar so it was good to hear him speak about it from a historical and personal point of view. P.V. Karunakaran, my friend from many years ago who is now a principal scientist at the Salim Ali Centre for Ornithology and Natural History (SACON), provided the final presentation on the theme of “grasslands-ecological services and biodiversity values.” It was good to see how Karu’s long term affinity with the High Range and Munnar has helped him collect very interesting data and finings. I especially appreciated the many charts and maps that were generated with GIS that illustrated his them of the importance of the High Range shola and grasslands mosaic systems. James Zacharias, the distinguished former wildlife warden to Eravikulam National Park, with forest guards on duty at the Rajamalai tourism. We did a short visit up here on the day of the Munnar conference. The audience included several important living legends in High Range conservation. The current wildlife warden R. Lekshmi and several of her staff were present. James Zacharias, an assistant and then wildlife warden on several different tours at Eravikulam, was in attendance as was his colleague Mohan Alempath (warden during an unforgettable winter visit to Eravikulam in 1997). A highlight for me was accompanying these friends and senior wildlife managers up to the Rajamalai tourism zone on two different outings. We were also joined by Vivek, Karunakarn and photographer Anil Kumar. A commercial photographer based in Cochin, Anil’s passion is the High Range and he has taken some of the finest Kurinji landscape shots. I enjoyed having a fellow photographer to compare notes with. Of course, it was too early for the full flowering of the Kurinji and I realized that I would have to plan a visit back in order to see the gregarious blooming in one of the finest grasslands/shola mosaic landscapes in the Western Ghats. Rajamalai interpretation center in Eravikulam National Park. Stunning images on informative display boards highlight the biodiversity and landscape as well as the threats of this critical Western Ghats protected area. Vivek, Anil (the artist behind many of the images), Karunakaran and others explore the Rajamalai interpretation center in Eravikulam National Park. I spent an extra day in the High Range, taking a productive visit to Gravel Banks and then back to Pampadum. Through the support of the High Range Wildlife & Environment society and KDH Tea I was able to revisit and further document several important areas. I am indebted to Jojo, Mohan and the team in Munnar that made this visit possible. Back at Inspiration Point near Top Station and the Yellapatty estate the day after conference. Calotes grandisquamis , the large-scaled forest lizard on a shade tree in tea estates near Top Station. Wildlife in the shadows: Malabar Whistling thrush (Myophonus horsfieldii) resident at the High Range Club. Nilgiri langur (Trachypithecus johnii) at Pampadum National Park. High Range Landscape Project (Project Document). UNDP. 2015. Web. India High Range Landscape Project. Advisory Review into Allegations of Non-Compliance with the Social and Environmental Standards and other Relevant Policies Relating to the India High Range Landscape Project in the Western Ghats of Kerala, India. 21 November 2016. Web. Karunakaran, P.V; G.S. Rawat and U.K. Unniyal. Ecology and conservation of the grasslands of Eravikulam National Park. Western Ghats. Wild life Institute of India. Chandrabheni, Dehra Dun,1997. Print. Karunakaran, P.V and Mathew K Sebastian. Land use and Management Plan for Production Landscape in Munnar. SACON/UNDP, 2015. Web. Lockwood, Ian. “Renewal in the high Range & Eravikulam.” Ian Lockwood Blog. September 2014. Web. “Munnar to host 4th World Congress on Mountain Ungulates.” The Hindu. June 19 2006. Web. UNDP. Final Report Hydrological Investigations in the Munnar High Range Mountain Landscape The Project on: India High Range Landscape Project, Munnar, Kerala. 2015. Web (via FLIPHTML5). Kitchen area of the Sholai School overshadowed by the higher ranges of the Palani Hills. Several weeks ago my family and I took an eye opening day trip to the Sholai School just down the hill from Kodaikanal. The visit has helped me think about ecological teaching and learning as well as themes that are at the center of my work as an educator, photographer and writer. I entered the teaching profession in order to make a living learning and teaching about the planet with a special focus on South Asia. Increasingly, as I was reminded of on this trip, the idea of sustainability has come to be a central theme in my professional and personal life. The Sholai School, also known as the Center for Learning Organic Agriculture and Appropriate Technology (CLOAAT), was set up by Brian Jenkins in 1989. It has grown slowly and now has considerable land area and a broad range of educational goals that it addresses. The school size is small-only about 40 students- but it addresses a range of ecological and sustainability themes . Students actively participate in their living, food production and the maintenance of the school. The teaching of J. Krishnamurti have been instrumental in shaping Brian’s world view and the pedagogical focus of the Sholai School. Brian is an old family friend who I first met when he spoke to our senior auto maintenance class at Kodaikanal International School in early 1988. The Sholai School also owns a Stirling Dynamics (India) ST-5 biomass-fueled engine which my father Merrick spent time looking at and advising Brian on. Brian Jenkins the founder, principal and man behind the Sholai School vision. 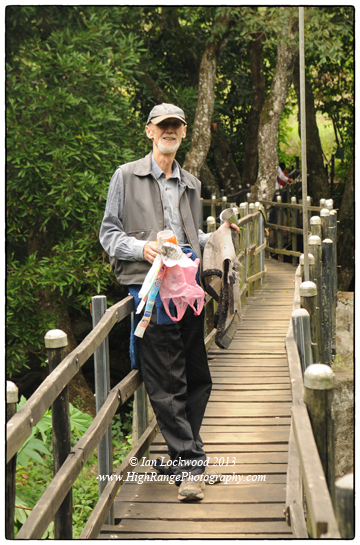 Seen here collecting rubbish at the school’s landmark footbridge. During the course of our visit we were able to see most of the campus and enjoyed a personal tour from Brian. The school was not in session but the staff was working on various projects and the fields. The Petupari Valley, where the school is located, is known for its coffee, fruit production, home-made cheeses and idiosyncratic people looking to make something different in the world. With an altitude of 1,000-1,400 meters it is a less extreme environment than the upper Palani Hills plateau. This is well suited for agricultural experiments and has the “goldilocks” just-right feel to its weather. Effective water management is a crucial aspect enabling success of the Sholai School experiment. The school uses surface water from streams, collects rain water and also has several wells, such that they are self-sufficient and free of any municipal or government water supply. They are independent of grid electricity and generate power through photovoltaic panels and a micro-hydroelectric turbine. Cooking is done on biogas (fed by waste from cows and the campus toilets) and wood collected from the large compound. The campus includes numerous plots of agricultural land where the community grows much of their own food using organic methods. The buildings, built of stone and covered with tiled roofs, are aesthetically pleasing and look similar to the nearby village hamlets. We weren’t able to observe classes in session but the critical aspect of the curriculum involves teaching students the practical skills for living sustainably. The Gandhian ashram ideal has influenced the planning and the whole community participates in daily maintenance (seva) of basic needs. Although Brian has had his differences with neighbors there is clearly an attempt to break down barriers and invite the local community to participate in the experiment. I appreciate this, remembering how so many international schools that I have been associated with function as bubbles of elitism in their communities. At the Sholai School there is an emphasis on hands on learning that primarily focuses on providing healthy, organic food. Brian has a special interest in mechanical learning and there are automotive and wood workshops, reminiscent to me of Johnny Auroville’s place. Brian’s historic 1930s Austin 7, the vehicle that our class had inspected in 1988, is still working and Sholai students get a chance to work on it and several other vehicles. Place-based pedagogies are important and the students learn about the area’s biodiversity, the traditions of the Tamil villages and the history of the area. I was thrilled to see that they have a GIS lab and have done interesting work in map the watershed that their streams are fed by. The school offers students a chance to sit for the Cambridge (IGCE) exams, which allows them a chance to reenter the other world and attend university. There are also opportunities for older “mature students” (university age) to spend time learning at the Sholai School. Clearly the Sholai School faces its set of challenges: recruiting and retaining faculty and staff is difficult and it takes a special teenager to take on the challenge of living and learning in its isolated valley. Brian is charismatic, headstrong and clearly eccentric, but he is a passionate voice for sustainability in the wilderness. Further up the hill from Sholai School is Kodaikanal International School (KIS), now moving into its 112th year. It is an established school that played a historic role in introducing the International Baccalaureate into India and the South Asian region. Ideas of critical thinking, service to the community, an appreciation of the idea of India and learning based on values are important elements of the KIS educational philosophy. As students many of us were exposed to ecological and conservation issues through weekend outings and explorations into the Palani Hills. In my experience, our self awareness and spiritual growth was nurtured not in the church pew or classroom, but by these outside experiences and the interaction with friends of diverse backgrounds all in a unique, south Indian mountain landscape. Flag Green on the main KIS campus. A favorite place for lazy afternoons, south Indian lunches and class interactions. The Ganga Campus of KIS, site of the primary and middle schools. The large area gives a sense of the “old kodai”- cool, spacious and green. KIS has its roots in American Christian missions that used to send their children from across Asia to attend what was then a small residential school in a very sleepy, unknown Indian hill-station. My parents were both amongst those children, travelling from Madhya Pradesh and Ceylon to a far off place called Kodai. All that has changed now and the school caters to a largely urban Indian/global clientele. The town has grown into a small urban area with year-round tourist traffic (think of Daytona Beach crossed with a picaresque hill station, set to a pulsating Bollywood dance number!). The school is physically surrounded by this growth, though it has some of the largest, green pieces of property in the township. The school maintains excellent academic standards, places students in outstanding world universities and has produced citizens that seek to change the world in a positive way. Service to the local and global communities are important values in KIS but students are nevertheless pampered. Many of the students come from extremely privileged backgrounds and a large, hard- working support staff helps to keep the campus fed, clean and running. Environmental education is thus far limited to a classroom, service projects and the hiking program and there is room to explore ideas of sustainability. As an educator and KIS graduate it seems that there is much to be learned from the Sholai School experiment just down the ghat road. 21st Century learning, an evolving pedagogical idea of our times, will have to extend itself from using media and technology in learning to addressing the pressing ecological needs of our times. Sustainability and how we as a species can thrive and survive without destroying our life support systems is a fundamental focus need for education. As KIS and other residential schools in India look to empower students with ecological world views and a greater understanding of sustainability, the Sholai School experiment offers a small-scale case study of a possible pathway. Basu, Soma. “Thank you Mr. Jenkins.” The Hindu. 24 May 2012. Web. 28 July 2013. “Kodai Hills Green School.” NDTV. Web. 25 November 2010. Web. 28 July 2013. Krishnamurti and Education. Web. 28 July 2013. Northfield Mount Hermon Work Program. Web. 29 July 2013. Check out this site to learn about the “work” program that all students participate in. “Rocky & Mayur share a vegetarian meal at the Sholai School.” NDTV. 7 October 2012. Web. 28 July 2013. Sholai School (Center for Learning Organic Agriculture) official site. 28 July 2013. The Sholai Way. Gobar Times. Web. 2006. 28 July 2013.